You can have complete ergonomic support now thanks to the E3 Adjustable Footrest by UPLIFT Desk. 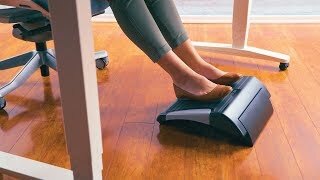 Enjoy this ergo-friendly footrest's four angled positions, which lets you find the perfect tilt that keeps your blood flow circulating and your comfort levels steady while you work. A rubber surface on the top of the footrest grips shoes to help you keep your feet steady so slip-ups don't happen. Simply flip out the two legs to create the tilt level you desire - 6, 12, 16, and 25 degrees. Now even your feet can work better and in more comfort with the E3 Adjustable Footrest by UPLIFT Desk. Do I need a footrest? If your office chair is too big for your body type or if you ever feel restless while seated, a footrest can help. The Adjustable Footrest by UPLIFT Desk is adjustable to let you find that ideal footrest tilt that keeps you comfortable at your desk. How adjustable is the E3 Adjustable Footrest by UPLIFT Desk? We're glad you asked! The Adjustable Footrest by UPLIFT Desk allows users to adjust to four completely different angled positions just by flipping out the footrest's two legs. This puts you in control of the footrest's positions. Can I wear boots with this footrest? Yes, the E3 Adjustable Footrest comes with a treaded rubber top surface, which means you can use it barefoot or with shoes, even boots and high heels! Sometimes my feet fall asleep when I'm seated in my office chair - what does this mean? Although this can be symptomatic of many desk configuration issues, one of the main reasons is that your chair is too tall for you. A footrest can help give your legs a boost and extra support they need to stay circulating ideally.